Radiator Blog: A short history of non-monoplanar first person movement. A short history of non-monoplanar first person movement. I'm working on a new game that reuses a lot of Souvenir's code, so lately I've been doing more research into non-monoplanar first person movement, meaning you're not limited to primarily moving along the X and Z axis / traversing across a single, fixed, designated "ground" plane. Traditionally, "noclip" flying / spectator modes have been the most common form of non-planar first person movement. 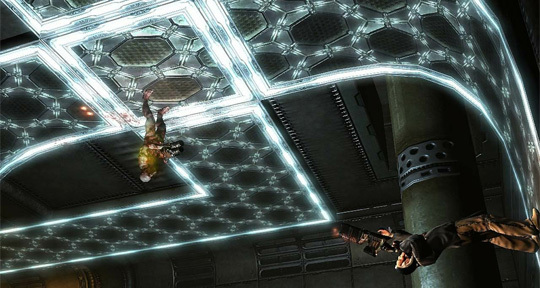 However, I'm not a fan of it as a movement mechanic because you're always "right side up" above a ground plane. Your idea of space never really changes because that's not the point. 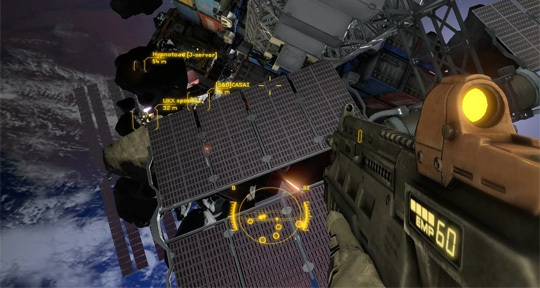 Shattered Horizon (2009) was a multiplayer FPS in space, where astronauts shoot each other while hovering around asteroids. From what I can grok in gameplay videos, players can rotate and hover freely, but they almost always maintain the same common "ground plane" as if there's a "right side up" in space. 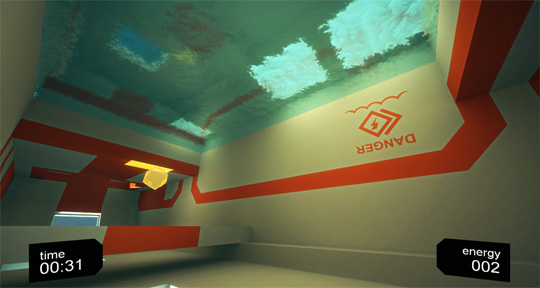 Common map layout terminology and directional lighting also reinforce the idea of a "top" of the map. 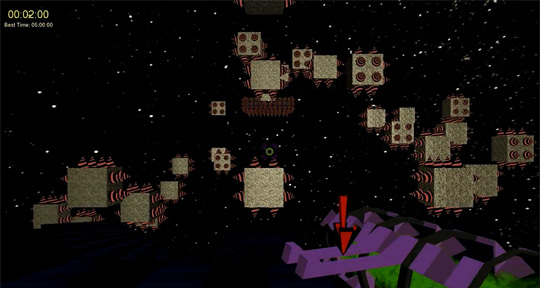 Flip'd is a 7DFPS about flipping gravity / walking on ceilings, and it joins a similar FPS project Delta-G. I don't think these work because they discard a very important rule from VVVVVV: that you must land on the ground before you can switch gravity again. 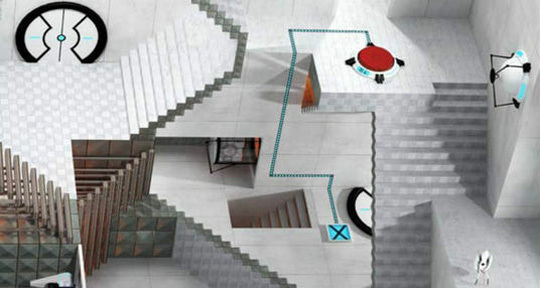 Thus, these games are less VVVVVV and more like Flywrench, where "hard puzzles" involve hovering around at high speeds while juggling other problems. Seeing as a two-dimensional Flywrench is already really hard by itself, I don't think it needs another dimension of death as well as a constantly spinning camera. Prey (2006) was an idTech4 FPS with a Native American protagonist (yay!) who walked on walls and ceilings but only on special tracks or by passing through certain forcefields (boo!). I think this design was the most immediately compelling, but the implementation was lacking. It was too much of a scripted level design contrivance that didn't allow for any emergent player strategies -- so basically Prey came up with a cool movement mechanic (as well as portals!) but then didn't really do anything with it. Uhh... oh, hm. That's a pretty short history, I guess. If you know of any other first person games that involve non-monoplanar movement, please correct me with a comment. Those were all the ones I could think of. EDIT: debate about "Descent" is below in the comments... but to summarize, I think it's important in these games that you're a "person" / biped / creature who walks, crouches, sprints, etc. are flight simulators also first person games if you move around based on a concept of acceleration / thrust / pitch? I don't think so, but let's argue it out!